Based on reviews from 1,928 users. Learn how our rankings work or see our guide to Sperry sneakers. Updated Apr 2019. It could be said that with the strong presence of Three Stripes and Swoosh sneakers in the market, Sperry is one of those underrated sneaker brands that have been in the industry for so long but could not surpass (or even be at par) the level of popularity of sneaker brand giants. Probably one primary reason is that Sperry, as a brand, is widely known for its boat shoes and deck shoes rather than its sneakers. With a rich history that roots back to 1935, the Sperry brand has always been synonymous with boat shoes or top-siders. It all began when brand founder Paul Sperry developed the first non-slip sole that was inspired by his dog Prince’s footpad. Sperry shoes were the first boat shoes made to function well enough for boating and sea adventures as they are designed to withstand boating deck conditions most especially slippery surfaces. It is the brand that can easily be associated and visualized with shoes that have a 360-degree lacing system, leather laces, water-repellent upper, highly durable stitching details, and, of course, a non-slip sole. From its first ever shoe model, the canvas Circular Vamp Oxford (CVO), Sperry has grown into an established brand that further expanded its production to other products, such as clothing and accessories, and different footwear categories that cater not only to men but also to ladies, kids, and babies. Unknown to most, Sperry also carries a lineup of products, including Sperry sneakers, that fall within its Casual category. Most Sperry sneakers have a low-top construction given the brand's boat shoe origins. Low-top Sperry sneakers have collars that fall just below the ankle and function to provide wearers flexible foot movement without any restriction around the ankle. Sperry also produces shoes with mid-top and high-top constructions but not under its Sneakers category. Such Sperry shoes are typically under the brand’s Boots and Chukka category. Sperry takes pride on its remarkable non-slip soles. It is a primary characteristic that brought Sperry Top-Sider shoes to fame and enabled the brand to leave a mark in the footwear industry. Another signature feature of most Sperry sneakers is the 360-degree lacing system. It is a type of an adjustable lace closure that goes around the ankle for a snug, comfortable, and secure fit. Sperry casual sneakers are made for men, women, and kids. They are available in an assortment of colors ranging from classic neutrals and nautical shades to bright hues and vibrant patterns and prints. Sperry fashion kicks are designed with both style and performance in mind. These shoes are ideal go-to pairs for an adventurous lifestyle because of their comfort, fashion, and function. Sperry sneakers can be categorized based on styles, such as classic lace-ups, canvas boat shoes, slip-on shoes, and athletic sneakers. Sperry sneakers under the Classic Lace-up category are most common in the market. They utilize a lace-up closure system that could vary in lace types or materials. Although the most common laces used on sneakers are flat or rounded cotton laces, Sperry sneakers also use leather similar to that used in boat shoes. They also make use of satin laces and wide laces for some women-exclusive models. One advantage of these shoes is that the lace-up closure provides a secure fit that can be adjusted depending on the wearer’s preference. The laces can also be replaced should the wearer prefers a different kind, material, or style. Canvas boat shoes are the more casual or laid back counterparts of Sperry's original boat shoes made of leather material. These shoes shadow a boat shoe's profile but utilize canvas instead of leather on the upper. They retain the 360-degree lacing system as well. The Sperry Bahama 2-Eye sneaker is one example of Sperry sneakers classified under this category. Its canvas upper in a boat shoe construction sits atop a vulcanized outsole. Slip-on Sperry sneakers are a popular choice of footwear for those who are always on the go because of their easy on and off wearing, convenience, and casual appeal. Most slip-on shoes have pull tabs on the heel, which function to help pull tight fitting sneakers into the feet. 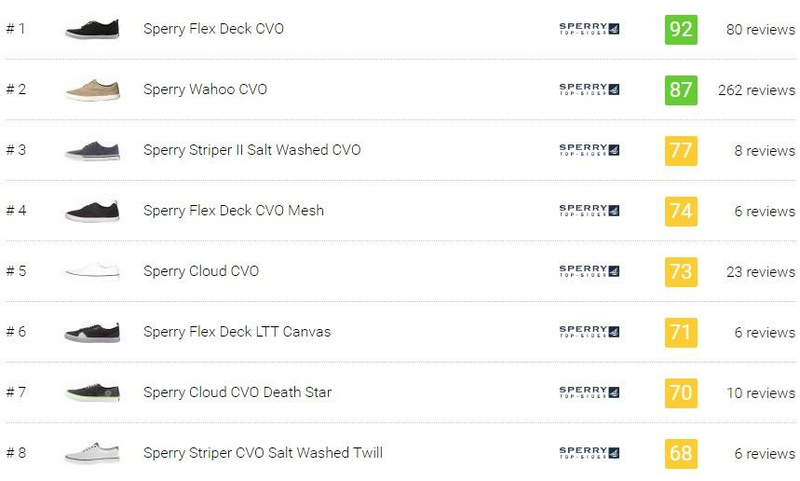 Some Sperry sneakers under this classification are the following: Sperry Flex Deck CVO, Sperry Striper CVO Salt Washed Twill, Sperry Striper Linen, Sperry Seaside Perforated, Sperry 7 SEAS Bungee Active, and more. Sperry Athletic Sneakers are those that exhibit a sporty visual profile while featuring top-of-the-line technologies that make them suitable for the streets. This kind of sneakers is not typical of Sperry, but the brand recently released the “Sperry 7 SEAS” collection that falls under this classification. Like sneakers from other brands, Sperry sneakers also vary in materials. They utilize either canvas, mesh, leather, suede, or a combination of two or more materials. Summarized below are some useful information that you could use when deciding which kind of Sperry sneakers to buy. 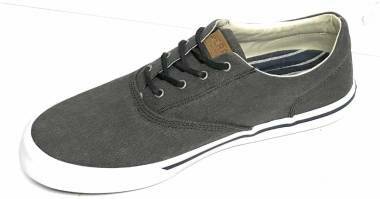 Sperry sneakers that are made of canvas material do not have much difference from other shoe brands’ canvas sneakers. These shoes are typically lightweight, breathable, flexible and easy to clean. Because of such characteristics, this type of shoes is perfect for the summer or on a hot day out. These sneakers also exhibit a simple look that makes them versatile style-wise. They are also cheaper than those made from other materials like leather or suede. 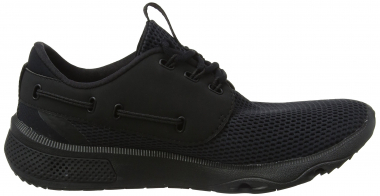 Sperry sneakers with full mesh or a mesh mix with other materials are generally comfortable, breathable, easy to clean, and lightweight. The soft material stretches out and has moisture-wicking capabilities, making them ideal during warm months. 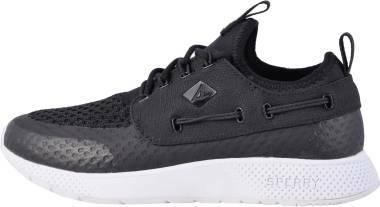 These sneakers are also cheaper than those made of more premium materials such as leather or suede but are relatively less durable. Leather sneakers, in general, are designed to withstand harsh weather conditions and the wear and tear of everyday use, and those produced by Sperry are no exception. Typically, they are durable but more expensive than their canvas or mesh counterparts. Some leather Sperry sneakers are even equipped with water-resistant features that make them even more appealing to adventurous consumers. Another characteristic of leather Sperry sneakers is that the upper material stretches over time and conforms to the foot’s shape. Unlike canvas or mesh, these shoes have a less laid-back appeal and can be worn with a dressier set of wardrobe. They are also timeless and never go out of style. Although suede is not a common choice of upper material for Sperry sneakers, there are still a few that utilizes it because of its premium look, excellent quality, and durability. One disadvantage, however, is that it could be difficult to clean. They could also get dirty quickly, primarily if not treated with a suede protector. Below is a quick guide on technologies commonly used in Sperry sneakers. Familiarizing yourself with these technologies and their functions would help you find out which Sperry sneakers would suit you best. The 360-Degree Lacing System is a simple technology that originated from its signature non-slip boat shoes. Aside from its aesthetic value, this innovation is a functional feature as it provides a secure fit all around the foot and enhances overall stability. Today's line up of Sperry sneakers includes models that flaunt this technology. The Adaptive Wave-Siping technology is designed to help water escape from the shoe. It works by dispensing liquid out of the shoe through innovative small and wavy slits on the rubber outsole which also give out an exceptional grip and traction. Sperry’s patent-pending Anti-Shock and Vibration Technology, or otherwise known as ASV Technology or ASV Solution, is engineered to reduce shock effects by approximately 30% to 40% in the heel. Sperry launched this innovative advancement in footwear in 2009 through its Summer 2009 footwear collection. It was initially aimed to help keep boaters stable on deck once a wave impacts the main body of a boat. Contrary to cushioning technologies used in running shoes, which provides high energy return, this midsole technology does the opposite. It works by lessening and dispersing shock and vibration, which in turn results in low energy return and eventually less discomfort and fatigue for the wearers. Sperry sneakers equipped with patented Dri-Lex lining technology are breathable and wick away moisture to keep the feet fresh and dry all day. This technology works through a four-step process and by using a multi-zone lining system. It transports perspiration vapor away from the skin via an underlayer of Hydrofil nylon. Hydro Grip Technology is used on rubber outsoles of Sperry sneakers for optimum traction and increased stability and agility. Listed below are some Sperry sneakers with molded Hydro Grip rubber outsoles. The Intense Vent Construction is used on the uppers of Sperry sneakers to help them shed water and dry quickly once wet. It is comprised of a system of non-absorbing and water-repelling mesh uppers with HydroPel technology. Omnivent Construction functions to keep the feet dry in all weather conditions. This system uses strategically positioned vents in the insoles and midsoles as passages of water that gets inside the shoes. It also helps in allowing your feet to breathe. Razor-cut Wave-Siping is an outsole technology utilized on the rubber outsoles of Sperry shoes, including Sperry sneakers. This technology is simple. As per its name, there are razor thin, wavy slits patterns evident on the rubber outsoles which function to provide maximum grip and traction whether on wet or dry surfaces. Listed below are some of Sperry sneakers with Razor-cur Wave-Siping rubber outsoles. The Seabound Integrated Energy Return System is Sperry’s underfoot cushioning technology that provides improved in-shoe comfort and plush ride on and off the deck. The Son-R Technology is a revolutionary sole system patented by Sperry. It provides sensory awareness with maximum stability and traction on all kinds of surfaces - even underwater. There are unique pods in the outsole that harmonize with an EVA midsole and an interactive removable footbed. The Star Wars x Sperry Collection was released in commemoration of Star Wars: Episode IV - A New Hope’s 40th anniversary. It includes a lineup of five Star Wars-inspired shoes such as the Droid Cloud Slip-On, the Han & Chewie Cloud Slip-On, the Rebel Pilot Cloud CVO, the Death Star Cloud CVO, and the McQuarrie Cloud Slip-On. Sperry shoe designer Joe Napurano designs all these shoes. The entire collection launched on August 10, 2017, in the US and select regions including Hong Kong, Thailand, Philippines, Japan, Germany, Panama, and Canada. Another batch of Star Wars x Sperry shoes launched on December 7, 2017, including three styles – the Authentic Original Darth Vader, the Cloud Slip-on Duel, and the Cloud Slip-on Logo. Jack Spade New York is the men’s line counterpart of Kate Spade New York brand but has its independent identity, website, and physical stores. In April 2017, the men’s fashion brand collaborated with Sperry to give a fresh Jack Spade-approved makeover to three of Sperry’s most iconic silhouette, the Cloud Slip-on Canvas, the Authentic Original 2-Eye Boat Shoe, the Seatmate 2-Eye, and the Cloud CVO Canvas. The collection retails from $74.95 to $99.95. The second part of the Sperry x Jack Spade collaboration launched in November 2017 including three more Sperry styles, the Authentic Original Lug Boot, the Cloud Chukka, and the Captain’s Oxford. Gray Malin is a renowned fine art photographer known for his aerial shots of famous beaches, parks, skis, and other destinations across the globe. He takes his photos from door-less helicopters. Malin reached out to Sperry to see if the footwear brand could bring his photos onto its shoes. Their first collaboration happened in 2015 with the release of a capsule shoe collection for spring. It is comprised of Sperry’s classic models, such as the Authentic Original, CVO, and CVO Slip-On, with three of Malin’s aerial photos from Sicily, Portugal, and South Africa. The shoes included in the collection are the Seacoast in Lisbon Umbrella, the Cloud CVO in Cefalù Umbrella, and the CVO Slip-on in Cape Town Wave. In 2017, Sperry released another collaboration with the aerial photographer which involves pastel suede materials printed with aerial photographs of South Beach, Bora Bora, and Rio de Janeiro. The collection includes the Gray Malin Bora Bora Slip-On, the Gray Malin South Beach Slip-On, and the Gray Malin Ipanema Slip-On. Noah is an American-based men’s clothing and a streetwear brand founded by former Supreme Creative Director Brendon Babenzien. Its collaboration with Sperry resulted to color-filled and SOS-printed Sperry classic silhouettes including the leather Top-Sider in color blocking design (Noah x Sperry Multi Top-Sider) and the canvas CVO in two options – one in similar color blocking style (Noah x Sperry Multi Cloud CVO) and another with SOS printed upper (Noah x Sperry SOS Cloud CVO). The entire capsule collection, which also includes apparel and accessories, released on May 24, 2018, with prices ranging from $48 to $298. The Circular Vamp Oxford shoes are the first ever Sperry shoe model produced. It is made of canvas upper and a non-slip vulcanized rubber outsole. The Authentic Original shoes, otherwise known as the AO shoes, were the first boat shoe designed and developed by Paul Sperry as a sturdier leather version of the canvas CVO shoes. It features the classic moccasin toe stitching and a 360-degree lacing system or “saddle” lacing. How much are Sperry sneakers? Pricing of Sperry sneakers varies depending on the materials and technologies used in a model, style, and type of release. Generally, they retail from $59.95 to $154.95. Sperry sneakers utilizing premium materials like genuine leather are more expensive than those using canvas or mesh. Exclusive releases, collaborations, and limited editions are also more expensive compared to mass-produced or general release models because of varying factors such as limited quantities, premium designs, or a sense of exclusivity that these kinds of Sperry sneakers provide. Are Sperry shoes available for women? Yes. Sperry sneakers are not limited only to men. Most Sperry sneakers models are designed for both men and women, and there are also those that are created and released exclusively for the ladies. Sperry also offers footwear products in kids’ sizing. What are the sizes available for Sperry lifestyle kicks? Sperry sneakers offered in men's sizing typically range from US 4 to 15, with exception to some models that reach up to size 18, in S (Slim), M (Medium), and W (Wide) widths. Women's sizing, on the other hand, is offered from 5 to 13 also in S (Slim), M (Medium), and W (Wide) widths. How should I clean my Sperry sneakers? Like in any sneaker from other brands, cleaning of Sperry sneakers would depend on the primary material used. For Sperry sneakers made of suede upper, you could use a suede brush and a suede bar. It is important to brush the material gently in the same direction to avoid damage. A protective spray could also be used once the shoes are cleaned. Cleaning leather Sperry sneakers would also require a brush and a leather cleaner. Use of detergent should be avoided as it could dry out the leather and damage the shoe. Canvas Sperry sneakers, on the other hand, are easier to clean by using a mix of warm water and mild liquid or powdered detergent. Use the solution by just brushing or spot cleaning the material and avoid submerging the whole shoe into it. Stuff the shoe with newspaper and let it air dry. Use a clean toothbrush, water and mild soap solution, and baking soda for cleaning the rubber soles. Can Sperry casual shoes be worn without socks? Classic Sperry top-siders or boat shoes are designed originally as boating shoes and meant to be worn without socks when on the deck. However, that doesn’t mean that Sperry sneakers should be worn the same way, mainly when used for casual functions and not for sailing. No-show socks or low socks could be your best option if you wish to wear socks with your Sperry sneakers. Wolverine World Wide, Inc. currently owns the Sperry brand, Inc. 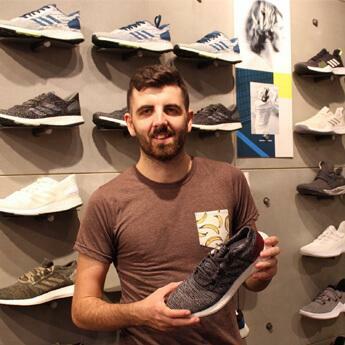 It is an American footwear manufacturer company that also owns other well-known footwear brands such as Hush Puppies, Keds, Merrell, Saucony, and more. Where is Sperry’s headquarters located? Sperry Top-Sider is an American footwear brand headquartered in Lexington, Massachusets. Sperry founder Paul A. Sperry was an adventurer and an innovator - a sailor born into a family with an extensive sea-faring tradition. In 1917, during World War I, he joined the United States Naval Reserve as Seaman First Class where he gained a significant amount of knowledge and expertise on seamanship. During the 1930s, he bought his first boat – a cutter named Sirocco. One late night aboard Sirocco, he slipped and fell off the deck, but he was, fortunately, able to climb back on board. That incident became Paul's primary motivation in creating the first-ever non-slip boat shoe. One winter day in 1935 in New Haven, Paul was working in his makeshift workshop at home and finding ways to make a non-slip rubber sole when he took a break and stepped out into the snow with his Cocker Spaniel named Prince. Unknown to Paul, that break would become a turning point in his career. He observed how Prince runs effortlessly on snow and that inspired him in finally creating the perfect non-slip sole. He carved grooves (now referred to as siping), which are patterned after his dog’s paws, on the rubber sole and glued that rubber sole on his old pair of shoes giving birth to the first Sperry Top-Sider prototype. Testing the first Top-Sider prototype shoe on board the Sirocco proved Paul that his innovation indeed prevents slippage. He had it patented, but when the time came that he wanted to market his product, the United States Rubber Company refused production. Paul did not give up. Instead, he made a deal with a Boston-based rubber company for the production of blank rubber soles in which siping would be done by himself using a machine of his design. Paul Sperry’s first shoe in production was the canvas Circular Vamp Oxford or otherwise known as CVO. Although equipped with a simple design, a canvas upper, cotton linings, and vulcanized rubber soles, it was completely comfortable and stable that its instant success was unquestionable. Although the CVO reached a certain level of popularity and saleability, Paul knew that he could further develop a sturdier version of the first Sperry Top-Sider shoe. Between 1935 to 1937, he introduced the first ever boat shoe, the leather Top-Sider called the Authentic Original or simply AO. It had a classic moc stitching and a saddle lacing or known today as the 360[Symbol]lacing system. Like the CVO, the AO was also an instant hit. Sperry Top-Sider even became the official shoes of the US Navy during World War II. In 1940, Paul Sperry sold his company to the US Rubber Company. During the ‘60s, Sperry’s popularity further reached a new height as its shoes became a fashion staple for college kids and in the “preppy” style fashion trend. Stride Rite Corporation acquired the brand in 1979 from the US Rubber Company along with Keds. The brand continued producing technological innovations for its shoes and partnered up with renowned world athletes. In 1987, Sperry Top-Sider became the official shoe for America's Cup. Fast forward to 2007, Sperry was bought by Payless Shoe Source as part of a multi-brand acquisition. Currently, the brand is owned by Wolverine World Wide, Inc. since its purchase from Payless Shoe Source in 2012.